On Tuesday we posted a story showing voter turnout in Kitsap County at right around 12 percent as of Monday. With Tuesday numbers we’re now at about 13.2 percent, according to data released by the Washington Secretary of State’s Office. As low as our turnout is, across the state it is worse at 10.2 percent. That does include incomplete data from a couple of counties. Okanogan County is so far reporting that out of 5,357 ballots sent out for two primary races, only three ballots have been returned. The Secretary of State’s Office confirms that number is incorrect, but the correct number won’t be reported until tomorrow. The only county larger than Kitsap that has higher turnout is Spokane County, which as of Tuesday is at 15.6 percent. King County turnout is at 8.3 percent. Pierce is at 7.5. Douglas County is the highest at 41.6 percent, but that’s among 322 votes. 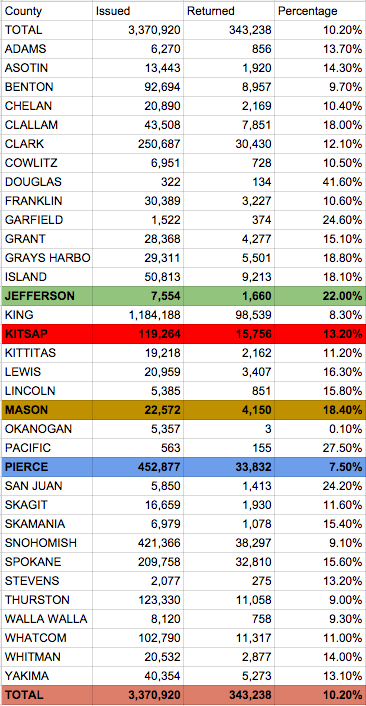 Jefferson County is at 22 percent and Mason is at 18.4 percent. Secretary of State Kim Wyman predicted 26 percent turnout, but as we pointed out in Tuesday’s story, if April is any indicator we are two-thirds the way of where we will be by next Tuesday, which would put the state’s projected total at about 16 percent. It will take a significant late run across the state to beat that. Here are the state numbers county-by-county, with the total, Kitsap and its neighbor counties highlighted. Five counties are not included because they do not have primaries. Bret Treadwell, who filed on the last day to do so as a Republican running against state Sen. Christine Rolfes, D-Bainbridge Island, has decided to not pursue the seat. Because his decision comes after the deadline, which was May 21, his name will still appear on the primary and general election ballots. Treadwell said he won’t be campaigning at all, however, and won’t have any information in voters’ guides. The former candidate said his decision to run was made quickly and up against a deadline. “It was kind of a last-minute decision with some folks kind of enrolling me in the last 12 hours,” he said. When filing week ended Rolfes had two opponents. D.J. Sweet withdrew on May 21. With Treadwell’s all-but-official withdrawal from the race, it essentially leaves Rolfes running alone for election to the seat she was appointed to in July of 2011. Rolfes jumped from the state House to the Senate when former state Sen. Phil Rockefeller, another Bainbridge Island Democrat, resigned to take a position with the Northwest Power and Conservation Council. Treadwell first indicated he was considering withdrawing after I contacted him for a story I’ll be writing about candidates with bankruptcy history. Treadwell filed for bankruptcy in 2009 while he was going through a divorce. Treadwell said he wasn’t interested in politics until started looking into the issues presidential candidate and U.S. Rep. Ron Paul, R-Texas, was emphasizing. Treadwell said someday he might like to try again, taking that same emphasis and applying it on a state level. The bulk of the Secretary of State’s announcement follows this brief conversation. In California it used to be that to vote in a party’s primary you actually had to be a declared member of that party. When the state changed that the parties sued and it ended up wrecking things for Washingtonians, who had voted for whoever the heck they wanted in the primary regardless of party. The Supreme Court struck down that system, and Washington eventually responded with the Top Two system. The Secretary of State explains in what follows. Washington lawmakers have approved a plan sponsored by Secretary of State Sam Reed and Gov. Chris Gregoire to suspend the 2012 presidential primary , to save over $10 million. The state will use the Iowa-style precinct caucus-convention process as the fallback system, and will return to conducting the more broadly based presidential primary in 2016. The House voted 69-28 on Tuesday in support of the Senate-passed plan, SB5119, which was forwarded to the Governor for her signature. The Senate vote earlier in April was 34-15. A number of lawmakers on both sides of the vote said they vastly favor the primary over the old caucus system that draws many fewer participants and excludes overseas voters, including the military, and house-bound people or those who are working during caucus time.